Correctly chosen technique and professionalism of doctors is a guarantee of success. In our clinic, we have only highly qualified specialists – doctors-dermatocosmetologists with many years of experience and knowledge of the latest modern technologies. We apply quality, certified methods and products, all procedures are carried out under sterile conditions, with observance of all necessary sanitary norms and rules. All this combining with the equipment of the best European manufacturers gives permanent results – the patients leave us rejuvenated, beautiful and healthy. Well proven minimally invasive method of face and body rejuvenation and correction. “Injections of youth and beauty” have become an excellent alternative to plastic surgery, which for many years was the only way to get rid of signs of aging and skin imperfections. 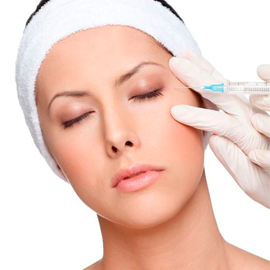 Hyaluronic Acid (Juvederm/Genyal/Restylane); Plasmolifting; Botox/Azzalure/Vistabel; Contour Plastics. Hyaluronic acid is a substance belonging to the group of polysaccharides synthesized by the cells of most living organisms, which is an important component of the skin, muscles, nerves and other tissues of a human being. Hyaluronic acid is essential for the formation of intercellular substance, which is a medium for cell functioning: their division, the supply of nutrients to them, the excretion of waste products. 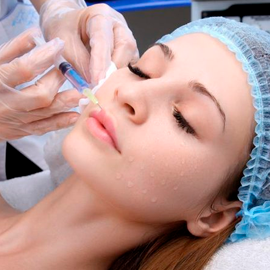 In modern cosmetology, hyaluronic acid is used as the main component of products for skin moisturizing. More effective agents for this purpose has not yet been found. Since hyaluronic acid is not the extraneous agent to the body, preparations based on it are hypoallergenic. БBrilliant Coco Chanel always said: in 20 years a beautiful face was given to you by nature, and how you will look in 50 depends only on you. Indeed, daily skin care and the use of “beauty procedures” can work miracles. One of such cosmetic procedures applied to prevent the aging of the face, as well as the skin of the decollete and arms is plasmolifting. What is Plasmalifting? Plasmalifting is a unique rejuvenation technique which implies interdermal injection of the patient’s own plasma. Plasmalifting provides rejuvenation at the cell level, so that body starts celullar regeneration. Those who undergo RPR treatment have shinning, toned, tightened and elastic skin. For a number of years, this cosmetic technique has been widely used by well-known Japanese, European and American clinics. Now Russian doctors as well began actively use Plasmalifting. to the plastic surgery clinic – Clinicestetic!